Whether spotting whales off the coast, hiking through lush canyons or indulging in a seafood medley, a unique experience unfolds on a Monterey Bay vacation. Book a Monterey Bay hotel and discover its intoxicating treasures. Monterey is a delightfully compact city, and extremely easy to navigate by foot. With a wealth of centrally-located hotels to choose from, you’re guaranteed a hassle-free, rejuvenating stay, wherever you decide to bed down. Culture vultures won't be able to resist the allure of the historic center, while honeymooners will be seduced by the romantic tranquility of Monterey Bay. 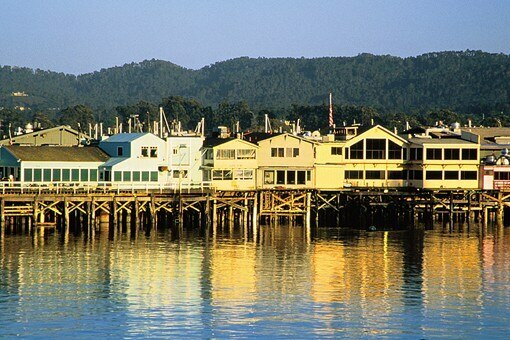 Families meanwhile, will be delighted by the exuberance and energy of fun-filled Cannery Row. Yes, there's the whale watching and gorgeously craggy shoreline, but Monterey isn't just about sightseeing. Shopping is also an essential component of any visit. With its long-standing reputation as a haven for artists, Monterey County is packed to bursting with galleries and art shops, while Downtown Monterey offers an eclectic range of independent establishments, from eccentric gift shops to treasure-packed antique centers. Of course, high street names can be found here too. The stunning, historical coastal city of Monterey is one of California’s most vibrant getaways. With a spectacularly rugged coastline, an array of glistening sandy beaches, a thriving arts scene, and an abundance of first-rate restaurants and shopping experiences, you’ll be enthralled. Take a surfing lesson, play a round of golf on a pristine course, or sample prize-winning local wines in sumptuous surroundings – it's all part of the appeal. With its enviable coastal location, year-round growing season, abundance of sea life, and world-renowned vineyards, Monterey is a veritable paradise for lovers of food and drink. As you might expect, local seafood features prominently on many menus – indulge in buttery lobster rolls, steaming clam chowder, or freshly shucked oysters. There’s also an abundance of markets, wineries, and craft breweries, ensuring that delicious taste sensations lurk around every corner.